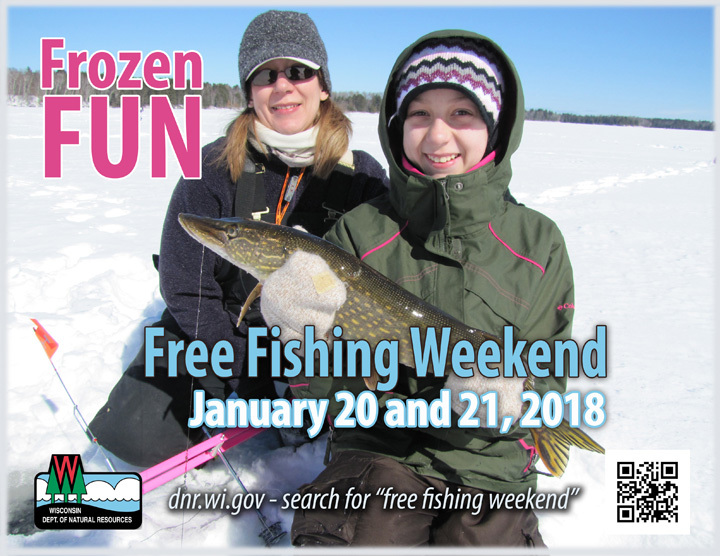 MADISON — Wisconsin’s winter Free Fishing Weekend is set for Jan. 20-21, 2018, and free loaner equipment and ice fishing clinics make it a great time for open water anglers to discover the fun of ice fishing or to introduce family and friends to this hard-water recreation. Fishing is free for Wisconsin residents and visitors alike on these days. No fishing license or Great Lakes salmon stamp or Inland Trout Stamp is needed to fish all inland waters and Wisconsin’s side of the Great Lakes and Mississippi River and other boundary waters. Spring trout ponds are not open, however. All other fishing rules apply, such as limits on the number and size of fish anglers can keep and any seasons when anglers must release certain fish species. “Free Fishing Weekend is a great way to get outside during the winter and have fun with family and friends,” says Theresa Stabo, Department of Natural Resources R 3 coordinator who is working on angling recruitment, retention and reactivation. It’s also a chance for anglers to try the early catch and release trout season for free. That season opened Jan. 6 and normally requires anglers to have a fishing license and an inland trout stamp to join in. Stabo says that people interested in ice fishing or trying the early catch-and-release trout season shouldn’t let a lack of equipment stop them. More than 20 DNR tackle loaner sites have ice fishing gear for loan that groups and individuals can use. Ice augurs are not available through DNR but fellow anglers are usually willing to drill a hole in the ice for newcomers or they can use an abandoned ice fishing hole, she says. So far, DNR is aware of free fishing clinics during Free Fishing Weekend at these locations: Devil’s Lake State Park in Baraboo; Straight Lake State Park in Polk County; Mauthe Lake State Recreation Area in Fond du Lac County; Perch Lake County Park and Maple Lake Public Beach in Oneida County; Glen Lock in Chippewa Falls; Brittingham Park in Madison and Fireman’s Park in Marshall. Fishing groups, local chambers of commerce, outing organizations, recreation departments and others hosting their own Free Fishing Weekend events can fill out an electronic form with their event details so DNR can help publicize events that are open to the public. MADISON – Following confirmation that wild deer tested positive for chronic wasting disease in western Vernon and central Dodge counties in 2017, baiting and feeding bans will begin Feb. 1, 2018 in these counties. As required by law, these findings establish baiting and feeding bans for La Crosse and Dodge counties, effective Feb. 1, 2018. La Crosse County is within 10 miles of the Vernon county positive wild deer, and due to being adjacent to a county with a CWD-positive test result, a two-year ban will be enacted. The ban for Dodge County will be enacted for three years. Existing baiting and feeding bans will remain in place for Vernon County. A 2-year-old buck harvested in Hamburg township is the third confirmed positive case in Vernon County, while a 1-year-old buck harvested in Clyman township is the first positive case confirmed in Dodge County. To determine if the disease is present in other wild deer in the area, disease surveillance will occur within a 10-mile radius around the positive locations. La Crosse metropolitan sub-unit deer hunters are encouraged to submit adult deer harvested for CWD sampling during the remainder of the metro sub-unit season. Anyone looking to learn more about CWD in Wisconsin is encouraged to check out an informational brochure found on the DNR website. For more information regarding baiting and feeding regulations and CWD in Wisconsin, visit dnr.wi.gov and search keywords “baiting and feeding” and “CWD” respectively. MADISON – Wisconsin’s bald eagle watching season kicks off Jan. 12-13 with the 31st annual Bald Eagle Watching Days in Sauk Prairie, and there’s never been a better time to see these magnificent raptors in Wisconsin. Bald eagle populations in Wisconsin have recovered since a low of 108 breeding pairs in the 1970s to a record high 1,590 breeding pairs in 2017. Bald eagles from northern Wisconsin, Canada, northern Michigan and Minnesota move south as the lakes and rivers they live along freeze over during cold winters. Seeking fish, a main food source, the raptors typically congregate along open water areas below dams along the Wisconsin, Mississippi and Fox rivers, where their growing presence has turned the sites into birdwatching destinations and inspired many community events. The Sauk Prairie Bald Eagle Watching Days event, held at various outdoor and indoor locations along the Wisconsin River in Sauk City and Prairie du Sac, is the oldest such event combining outdoor viewing opportunities, exhibits and live raptor shows. 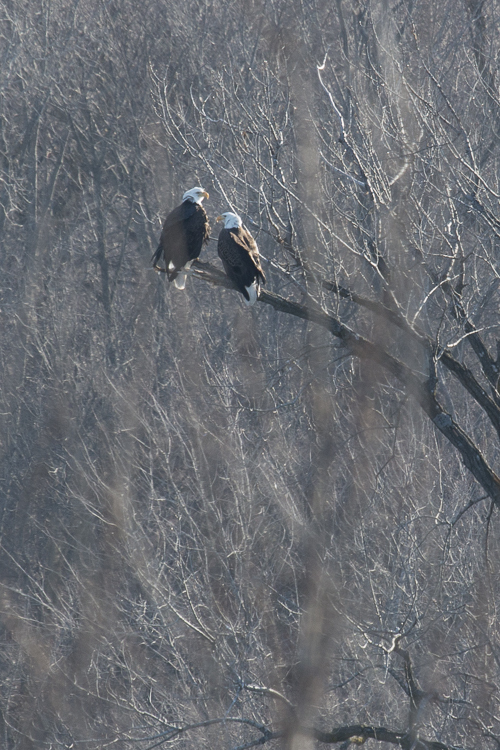 DNR’s Natural Heritage Conservation Program co-hosts Bald Eagle Watching Days with the Ferry Bluff Eagle Council, the Sauk Prairie Area Chamber of Commerce and the Tripp Heritage Museum. “Bald Eagle Days allows all of us to enjoy the majesty and beauty of our nation’s symbol in common fellowship,” says Sumner Matteson, an avian ecologist with the DNR Natural Heritage Conservation Program. Also new this year, Art Shegonee, a Menominee and Potawatomi member and Native American educator and dancer, will share ways the bald eagle is important to Native American culture, Barzen says. In addition to the Sauk Prairie event, other communities have added events built around watching eagles as populations of the raptor have increased and expanded geographically. Known eagle watching events include the following listed below; find links to these and more eagle information on the eagle watching page of the DNR website. Bald Eagle Appreciation Days on February 23-24, 2018, in Prairie du Chien, Wis.
Eagle Watching Day March 3, 2018, in Ferryville, Wis. When viewing eagles at these events and on your own, please take care not to disturb them. Do not venture so close that you cause them to fly off. They need their energy to keep warm through the long winter night. Stay in your car unless you are at a staffed viewing site. MADISON – Wisconsin’s early catch and release trout season opens Jan. 6 on hundreds of waters statewide and provides another fishing opportunity to help anglers beat cabin fever. 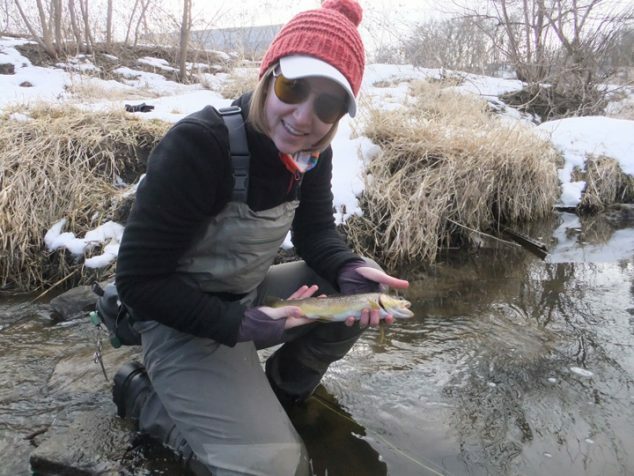 “The long season offers anglers a great opportunity to try the early trout season if you haven’t before,” says Joanna Griffin, Department of Natural Resources trout team coordinator. The season is open on all classified trout streams in 46 counties and there is at least one stream open in 18 other counties. All streams in Brown, Calumet, Door, Kewanee, Manitowoc, Menominee, Outagamie and Winnebago counties are closed. The season opens at 5 a.m. on January 6 and runs until midnight May 4. All anglers are not required to use barbless hooks but artificial lures and flies are still required. All fish caught must be immediately released; the bag limit is zero. Anglers who fish the early catch and release season need an inland trout stamp as well as a valid Wisconsin fishing license. The 2017-2018 fishing license and stamp are good through March 31. Anglers fishing after March 31 will need to buy a 2018-2019 license to fish the early season in April and May. Wisconsin has more than 13,000 miles of trout streams, including more than 5,300 miles of Class 1 trout streams in Wisconsin. These high quality trout waters have sufficient natural reproduction to sustain populations of wild trout and require no stocking. Another 40 percent of the waters are Class 2 waters that may have some natural reproduction by require stocking to maintain a desirable sport fishery. Anglers fishing the early trout season should take many of the same kind of precautions that ice anglers do, including knowing local conditions, fishing with another person, and carrying a cell phone. Find more winter fishing safety tips on ice safety page of the DNR website. MADISON – The Wisconsin State Park System is once again hosting First Day Hikes on New Year’s Day. These hikes offer visitors an opportunity to begin the New Year rejuvenated and connected with nature. In its biggest year yet, First Day Hikes will be happening at 17 state properties, spanning all four corners of the State. From Bong to Pattison, and Newport to Buckhorn, everyone’s invited to kick off 2018 on the right foot. This is the seventh year Wisconsin has participated in the nationwide First Day Hikes campaign with 17 hikes statewide — the most ever offered. On Jan. 1, 2017, 679 participants hiked 1,748 miles at 13 different Wisconsin state park properties. Nationwide last year, more than 62,000 people took part in guided hikes that covered over 114,165 miles on 1,300 different hikes across the country, according to the National Association of State Park Directors. A 2018 Wisconsin state park admission sticker is required for entrance to most parks for these events and will be on sale at park offices. 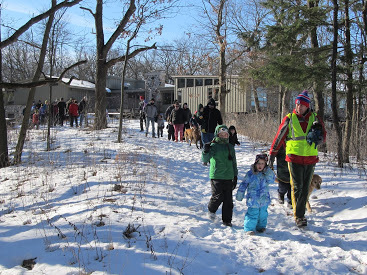 Kettle Moraine State Forest – Lapham Peak Unit – Begin the new year outdoors! This year Lapham Peak will be holding two First Day activities. Start your morning bright and early with a First Day Ski. This event is a combined effort by the Peak Nordic Ski Club and The Friends of Lapham Peak Snowmaking Project. Drop in during the day to enjoy the man-made snow Nordic ski trails. Add your distance to the number of recorded skied kilometers for 2018! Bring water, food, headlamps (if you will be skiing when it is dark), and Nordic skis. Pets are not allowed on the groomed ski trails. Meet at the Evergreen Shelter and man-made snow loops. Reliable snow is a wonderful thing to get us all off the couch! Time: 6 a.m. to 8:30 p.m. Then later in the day join members of the Waukesha/Milwaukee County Chapter of the Ice Age Trail Alliance for their annual First Day Hike at Lapham Peak. Hike options of varied lengths will be offered to accommodate families, and those wanting longer walks. Warm up afterwards with hot beverages and snacks at the Hausmann Nature Center. Meet at the Hausman Nature Center parking lot. Time: 11 a.m. to 2 p.m. Phone: 262-594-6200. Email: amanda.kutka@wi.gov. A state park sticker is required for either event and can be purchased at the property. MADISON – Department of Natural Resources biologists confirmed four photos of a cougar wandering through Douglas County in mid-November 2017. Two of the photos were captured on the same day on two properties roughly 2.5 miles apart in the Foxboro area. Three days later, an additional two photos were captured on separate properties in the Bennett area, roughly 4.5 miles apart. 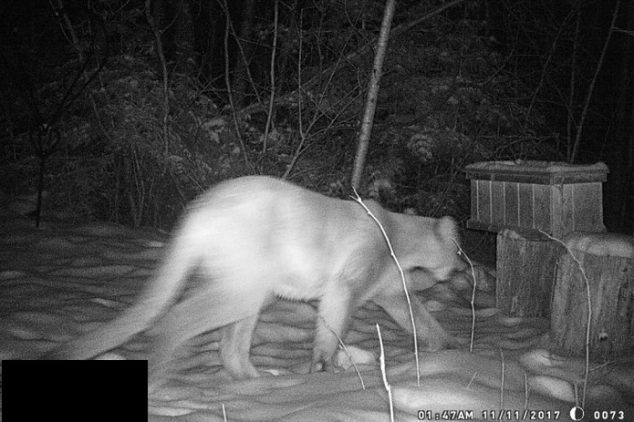 It is unknown whether this cougar is the same animal photographed on multiple trail cameras in central Wisconsin between early August and late October 2017. 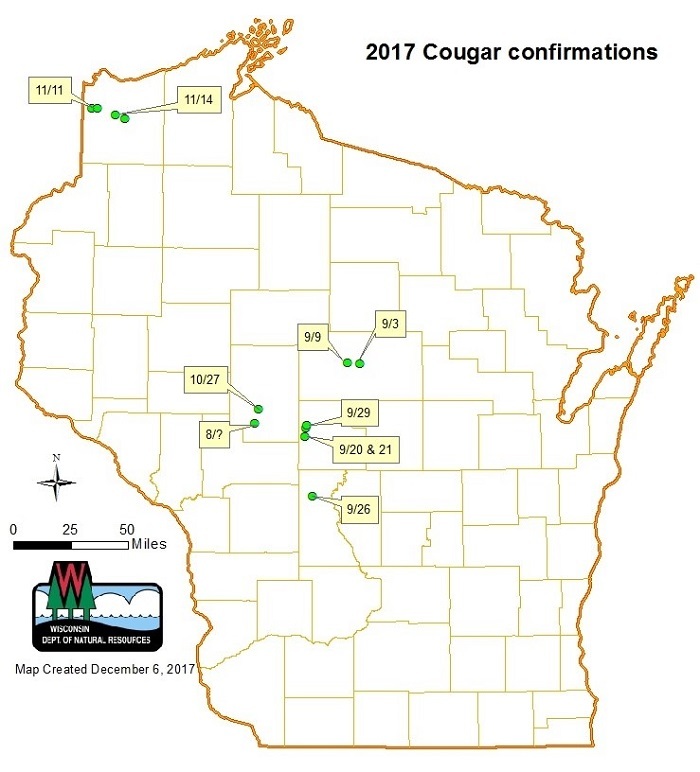 Minnesota Department of Natural Resources staff confirmed two photos of a cougar near the Iowa border in early September 2017, this confirmation coincided with confirmed trail camera photos of a cougar in Marathon County during a similar time period. Without biological material for genetic testing, there can be no confirmation whether the cougar photographed in Douglas County is one of these animals. As a reminder, suspected cougar sightings can be reported using the large mammal observation form. There is currently no evidence that cougars are breeding in Wisconsin. Biologists believe the cougars known to have entered Wisconsin are male cougars dispersing from a breeding population in the Western United States. Cougars are a protected species in Wisconsin and cannot be shot unless attacking a human or a domestic animal. Cougar attacks on humans are very rare, and there have been no confirmed conflicts between cougars and people or domestic animals in Wisconsin. MADISON – Now that cold temperatures have finally arrived in Wisconsin, all that is needed are some good snowfalls to get trails ready for the more than 30 candlelight events scheduled for this winter at Wisconsin state park, forest, recreation area and trail properties. Hundreds of luminaries are placed out along trails for candlelight events. These are in ice buckets at the Southern Unit of the Kettle Moraine. This winter’s candlelight events kick off December 31 with a New Year’s Eve Candlelight Hike at Amnicon Falls State Park about 7 miles east of the Superior city limits in Douglas County. Then on January 6 Blue Mound and Mirror Lake state parks will hold events. The largest number of events will be held January 27, February 3 and February 10. Skiing, snowshoeing and hiking by candlelight has been attracting more visitors to properties each winter. Events at Lapham Peak Unit of the Kettle Moraine State Forest and Horicon Marsh Education and Visitor Center attract so many visitors that all of the available parking fills. Horicon now offers shuttles from other locations and parking vouchers are required prior to arrival at the Lapham Peak event. “We encourage people to plan ahead and to consider attending a candlelight event at a property they may not have visited in the past. Also we will use our Twitter social media platform to alert people when an event has reached capacity or has been cancelled due to inclement weather,” Holtan said. Some properties offer skiing, snowshoeing and hiking, while others offer just skiing or just snowshoeing and hiking. Most events begin around sunset and run until 8:30 or 9 p.m. Many of the events include additional activities such as bonfires, and hot chocolate and other refreshments may be available for sale. Some events offer grills for cooking food or roasting marshmallows. 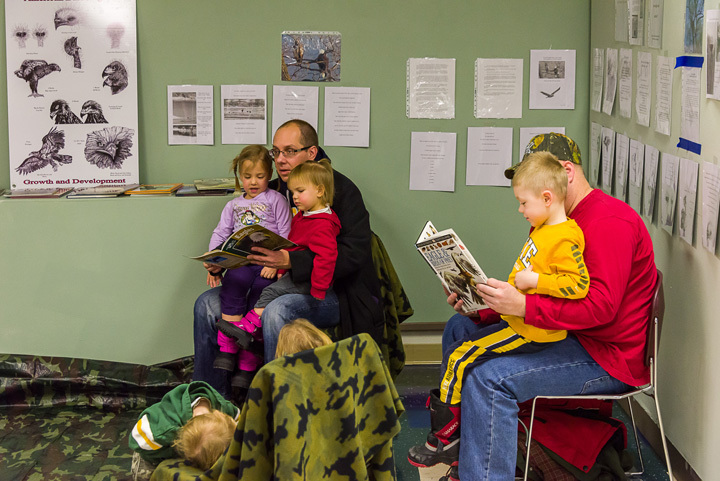 Some properties have warming shelters that are open for the events. Many of the events are organized by the friends groups of the parks, which provide much of the volunteer labor for the events. Most events offer a combination of skiing, hiking or snowshoeing but some are ski only and some are hike only. Be sure to check listings for details. People can check on the details of each event by going to the Department of Natural Resources website, dnr.wi.gov, and searching keyword “candlelight.” For more information on park or forest properties and locations, search for keywords “find a park.” Regular park and trail fees apply for the events unless otherwise noted. While most events will not be cancelled due to lack of snow, they still could be cancelled if conditions are icy, extremely cold or have severe wind chills, so people are encouraged to check the website, follow the DNR Twitter feed, or call properties directly to confirm the event will be held if threatening weather is in the forecast. Amnicon Falls State Park – New Year’s Eve Candlelight Hike: Get outdoors at Amnicon Falls on the last day of 2017! About 1.5 miles of trail will be illuminated with candles, including the island and Horton bridge where you can see three of the four park waterfalls. New for this year, visitors can check out the new contact station and visitor center. There will also be hot cider, hot chocolate, a bonfire, and materials for making s’mores! Sponsored by the Friends of Amnicon and Pattison state parks. Blue Mound State Park – Candlelight Ski, Hike and Snowshoe: Spend a night with family and friends at Blue Mound as we welcome in the New Year with a candlelight ski, hike and snowshoe event, hosted by the Friends of Blue Mound State Park. A 1- and 2-mile candlelit, wooded loop will be available to ski, and a separate 0.75-mile candlelit, wooded trail will be available for hikers, snowshoers and leashed pets. Warm up with free hot drinks inside the heated shelter. Hot refreshments, baked goods and shirts will be available for sale. Enjoy the bonfire and free marshmallows for roasting. Guided hikes through the illuminated woods with the park Naturalist will be held at 6 and 7 p.m. The only cost for this fun-filled family event is a daily or annual park sticker, which may be purchased upon entry to the park. Mirror Lake State Park – Candlelight Ski, Hike, and Snowshoe: Join us for our annual winter hiking, skiing and snowshoeing event. There will be bonfires, hot chocolate and hot cider and of course, sweet treats all for a good will donation. Sponsored by the Friends of Mirror Lake State Park. Many events also feature bonfires, like this one at Blue Mound. Lake Kegonsa State Park – Candlelight Ski: Enjoy 2 miles of groomed ski trails lit with hundreds of glowing luminaries. When you are finished, warm up by the bonfire and enjoy hot cocoa and baked goods sold by the Friends of Lake Kegonsa State Park. This event is a ski only. Hiking, pets and snowshoeing are not permitted on groomed cross-country ski trails. This event is weather dependent, if snow or weather conditions do not permit, a back-up date is scheduled for Saturday, February 10, 2018. Wildcat Mountain State – Candlelight Ski/Hike and Winter Stargazing: Join us for our annual winter hiking, skiing and snowshoeing event. Enjoy the torch-lit trail as it winds through the old orchard on the ridge. There will be bonfires and refreshments available to warm you up. Enjoy star gazing in the crisp winter air. Telescopes and astronomy information will be presented by the Astro Educators provided by our neighbors at the Kickapoo Valley Reserve. All activities will start near the park maintenance shop. Sponsored by the Friends of Wildcat Mountain State Park. A park sticker is required and can be purchased at the park entrance. Copper Culture State Park – Candlelight Hike/Snowshoe: Join us for an evening hike/snowshoe at Copper Culture. A scenic trail will be lit with luminaries through the woods and along the Oconto River. The trail starts at the shelter building. A warming fire and hot chocolate is provided. The event is free but donations are appreciated. Well behaved, leashed pets are welcome on the hike. For more information contact the Oconto Park’s Department at 920-834-7706. 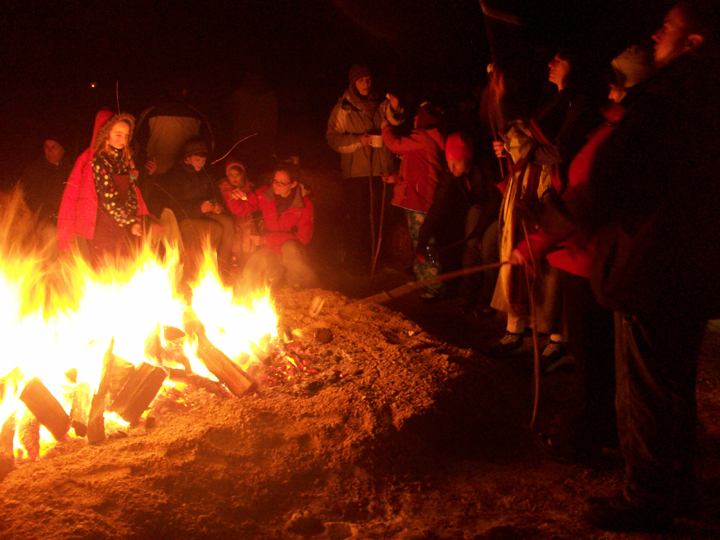 Horicon Marsh Education and Visitor Center – Candlelight Hike: Hiking by candlelight, a roaring bonfire, roasted marshmallows and warm refreshments await everyone at the 8th annual Horicon Marsh Candlelight Hike. There are two trails available. One trail is 1.5 miles and another “Family Loop” is only 0.36 miles. The Education Center will be open for people to warm up, view the 20 minute “Horicon Marsh Story.” The Northern Cross Science Foundation astronomers will be on site to help you view the night sky through telescopes or to talk about the stars if it is cloudy. Friends of Horicon Marsh Education and Visitor Center will line the trails with candle-powered luminaries to welcome and guide hikers. Volunteers will be on hand for assistance and information. Admission to the event is free; however, please consider bringing a non-perishable food item or hats/gloves/mittens for our food drive and mitten campaign to be donated to local schools and food pantries. Parking is limited at the education center so please consider using the shuttles. Free shuttles will be available from Mayville and Horicon from 4:30-9:30pm. The Mayville Shuttle will be located at Theiler Park. The address is N8282 County Road TW, Mayville, WI 53050. The Horicon Shuttle will be located in the Bethesda parking lot at 620 Washington St, Horicon. For more information visit: www.horiconmarsh.org. Governor Dodge State Park – 19th Annual Governor Dodge State Park Candlelight Ski, Hike and Snowshoe: Ski, hike, or snowshoe a trail lit with glowing candlelight. Warm up by the bonfire after enjoying the trail. Snacks and hot beverages will be available for purchase. Weather and snow conditions will determine trail location. Sponsored by the Friends of Governor Dodge. Sorry, no pets please. Vehicle admission stickers are required and will be available for purchase at the event. 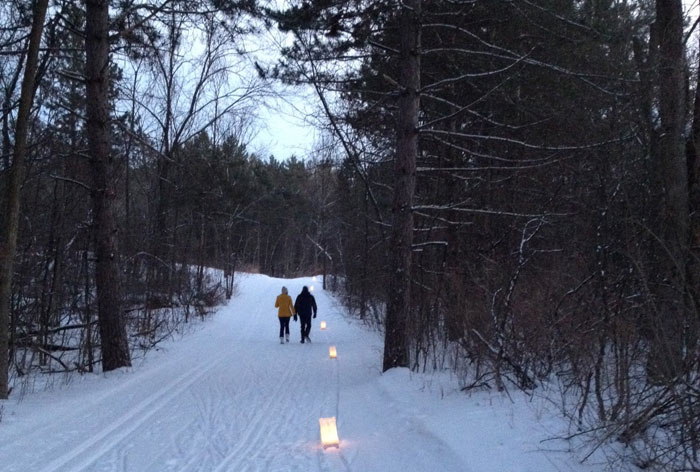 Kettle Moraine State Forest – Southern Unit – Candlelight Ski and Hike: Ski or hike the 1.6-mile purple loop of the Nordic Trails through the woods that will be illuminated by 450 candles! No hills-no spills! There will be a bonfire to roast marshmallows or cookout. Food will be available for purchase, provided by the Kettle Moraine Natural History Association. The trail will be groomed for classic skiing – no skate skiing or skijoring. Pets are allowed on the ski trail – for this event only. All vehicles will need a vehicle admission sticker. The Nordic Trail is located on Hwy H – about 4 miles south of Palmyra and 1.5 miles north of LaGrange. Red Cedar State Trail – Annual Candlelight Ski and Hike: Cross-Country Ski the candlelit Red Cedar State Trail from the Depot to the lit ice wall. Snowshoe the candlelit trail in Riverside Park. Hike the candlelit Junction City Trail. All activities start at the Red Cedar State Trail Depot, Highway 29 West. Enjoy free hot chocolate and door prizes provided by the Friends of the Red Cedar State Trail/Hoffman Hills [exit DNR]. There will be a bonfire will keep you warm and the depot will be open. Skis are required for the Red Cedar State Trail. Bring your own skis, or a limited number are available for rental at Stout Adventures – 715-232-5625. Bring your own snowshoes or use for free, snowshoes are generously provided by the Mayo Clinic Health System. Hartman Creek State Park – Candlelight ski, hike and snowshoe: Come out and ski, hike or snowshoe by candlelight around Hartman Creek State Park! Start at the shelter by Hartman Lake, where fires and snacks will be waiting, and go around the lake and woods. A vehicle admission sticker is required. This event is sponsored by the Friends of Hartman Creek State Park. Kettle Moraine State Forest – Lapham Peak Unit – Friends of Lapham Peak Annual Candlelight Ski/Hike: The Friends of Lapham Peak will host the park’s annual Candlelight Ski/Hike at the Homestead Hollow Picnic Area. Ski, snowshoe or hike by candlelight on a 1-mile trail! Afterwards, join us by the campfire where a large grill will be available for use, and hot beverages and treats will be available for a small donation in the Trecker Lodge. Parking inside of the property is limited to approximately 450 vehicles. Parking for cars and pickup trucks only – no trailer, bus or RV parking. There is no roadside parking. A 2018 Wisconsin State Park annual vehicle admission sticker or a $5 Special Event daily vehicle admission fee is required per car. In addition to the vehicle admission, a ticket voucher is required for each vehicle that wishes to attend the event. Vouchers are available first-come, first-served. Limit one per person at time of pickup. Park staff encourages people wishing to participate in the candlelight hike to pick up a voucher at the Lapham Peak office prior to 6 p.m. on Friday, Jan. 26, 2018 in order to ensure access to the event. Carpooling is encouraged. Please call ahead at 262-646-3025 to ensure vouchers are still available. Ticket vouchers will specify the admission time and will need to be printed by the entrant and presented at the gate for access. Entrants should arrive during the time frame specified. Ticket voucher time frames: 6 to 7 p.m., Max 250 cars with reservation: 7 to 8 p.m., Max 150 cars with reservation; 8 to 8:30 p.m., Entrance gate discretion (Late skiers must start by 8:45 p.m.) For more information, visit the Friends of Lapham Peak website [exit DNR] or call the Lapham Peak office at 262-646-3025. Lake Wissota State Park – Candlelight Ski, Hike and Snowshoe: Come out to Lake Wissota State Park to ski, hike or snowshoe on beautiful candlelit trails. Campfires will be provided, but please bring your own provisions for hotdogs or s’mores. Hot chocolate and hot cider will be available. Snowshoes will also be available to borrow with a suggested donation. Parking will be in the boat landing parking lot. A vehicle admission sticker is required and may be purchased at the park. Sponsored by Friends of Lake Wissota State Park. Point Beach State Forest – Candlelight Ski and Hike: The Friends of Point Beach State Forest will again be sponsoring the annual candlelight ski/hike on Saturday, January 27 from 5 to 9 p.m. Ski or hike a 1-mile candlelit trail through the forest. Afterwards, enjoy the warm fire in the Lodge where food and refreshments will be available for sale. 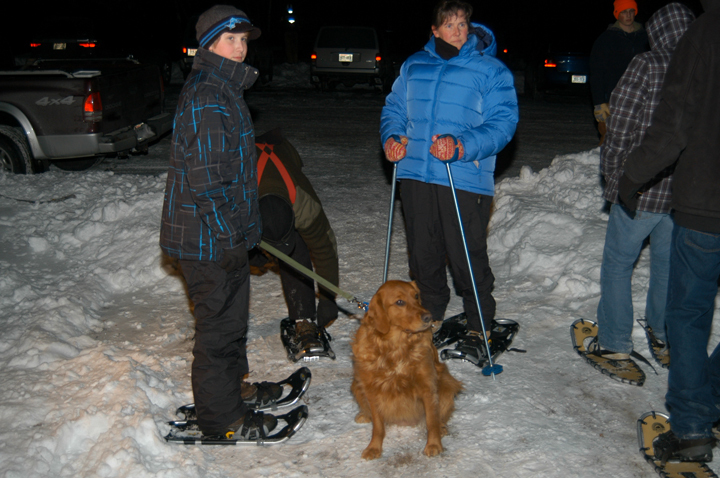 Some events allow pets on a leash, like the snowshoe hike at Rib Mountain, but others do not. Pets are generally not allowed on groomed cross-country ski trails. Rib Mountain State Park – Candlelight Snowshoe Hike: Start your hike at the new Friends Gathering Space, just past the Park office. Some snowshoes are available to borrow but suggest you bring your own snowshoes if you have them (flashlights and headlamps suggested). There will be hot chocolate, hot cider, and special goodies, as well as marshmallows to roast around the campfire. Donations to cover costs are welcome. An annual or daily park admission sticker is required. Parking is limited, so please consider carpooling. Sponsored by the Friends of Rib Mountain State Park. Whitefish Dunes State Park – Candlelight Ski and Hike: Join the Friends of Whitefish Dunes and Park Staff for the Whitefish Dunes State Park annual winter candlelight event. Trails will be lit with hundreds of luminaires for both skiing and hiking/snowshoeing. Pets and sleds are not allowed on the ski trail portion of this event. If snow conditions are not favorable for skiing on the trails, a candlelit hike will still take place. Refreshments will be available. A park sticker is required and can be purchased upon arrival. Crex Meadows State Wildlife Area – Crex Candlelight Snowshoe Hike: Enjoy a peaceful evening walking or snowshoeing on the 1.25 mile trail behind the Visitor Center. Luminaries will light your way through the woods. Warm up inside with hot chocolate and baked goods. Snowshoes available on a first-come, first-served basis, or bring your own. Even with little to no snow, we will still have the event. Flashlights/headlamps suggested. Sponsored by the Friends of Crex Meadows. Big Foot Beach State Park – Candlelight Hike: The Friends of Big Foot Beach State Park are hosting a candlelight hike at the park shelter. Enjoy an evening hike, then warm yourself by the bonfire while enjoying hot chocolate and s’mores. Fun for all ages! A daily or annual park admission sticker will be required. Black River State Forest – Candlelight ski and snowshoe: Join the Black River State Forest and the Black River Forest Trail Foundation for a night of skiing, snowshoeing, hiking and fun! A 1.5-mile ski trail and a 1.0-mile snowshoe/hike trail will be lit with candle luminaries. Warm up around a large bonfire or in the heated shelter. Hot chocolate and hot dogs will be available for purchase. Meet at the Smrekar shelter located 4 miles east of Millston off County Road O. This event will still be held as a hike/snowshoe if there is not enough snow for skiing. Blue Mound State Park – Candlelight Ski, Hike and Snowshoe: Spend a night with family and friends at Blue Mound as we welcome in the New Year with a candlelight ski, hike and snowshoe event, hosted by the Friends of Blue Mound State Park. A 1 and 2-mile candlelit, wooded loop will be available to ski, and a separate 0.75-mile candlelit, wooded trail will be available for hikers, snowshoers and leashed pets. Warm up with free hot drinks inside the heated shelter. Hot refreshments, baked goods and shirts will be available for sale. Enjoy the bonfire and free marshmallows for roasting. Guided hikes through the illuminated woods with the park Naturalist will be held at 6 and 7 p.m. The only cost for this fun-filled family event is a daily or annual park sticker, which may be purchased upon entry to the park. Flambeau River State Forest – 26th Annual Flambeau River Candlelight Ski and Hike: Get outside this winter and enjoy lighted trails at the Flambeau River State Forest. A 1.8 kilometer loop of the Flambeau Hills Trail will be groomed, tracked and lit with more than 600 candles. The trail winds through the heart of the forest and is wide enough for diagonal striders and skate skiers. Hiking and snowshoeing are also permitted on the trail during this event. Picnic tables and a large grill will be available, with refreshments/snacks provided. There will also be large warming fires maintained throughout the night. Trail pass fees are waived during the event. This event will take place regardless of snow conditions – if there is no snow, take a candlelight walk. The Flambeau Hills Trailhead is located on County Highway W, about 21 miles west of Phillips and 15 miles east of Winter. At many events friends groups sell or offer hot refreshments, like this event at the Flambeau River State Forest. Photo Credit: Jim Kuchler, Friends of the Flambeau River State Forest. Mirror Lake State Park – Candlelight Ski, Hike, and Snowshoe: Join us for our annual winter hiking, skiing, and snowshoeing event. There will be bonfires, hot chocolate and hot cider and of course, sweet treats all for a good will donation. Sponsored by the Friends of Mirror Lake State Park. Peninsula State Park – Candlelight Ski and Hike: Enjoy a 1-mile loop through forest and meadow with hundreds of candles lining the trail. 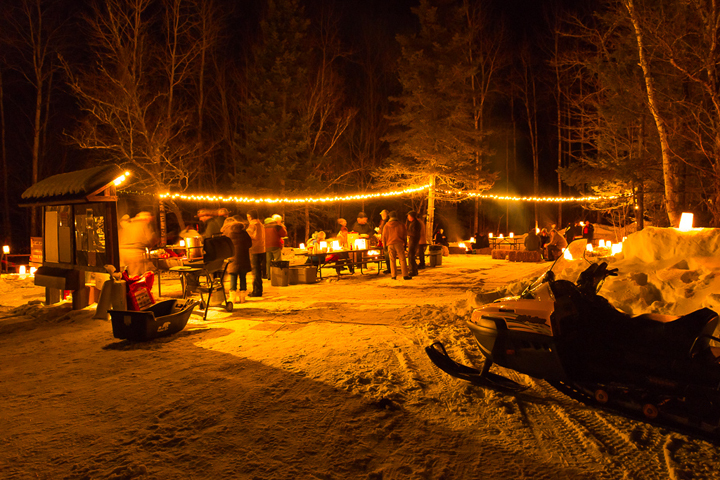 Following the ski or hike, participants can enjoy a bonfire with refreshments in the warming shelter. Co-sponsored by the Friends of Peninsula State Park. Pets are not allowed at the event. Event will be cancelled if weather is severe. A state park vehicle admission sticker is required and can be purchased at the park headquarters or self-registration station. A trail pass is not required for this event. Enter at Highland Rd., one mile north of Fish Creek at Hwy 42 and Co Rd A. Park in Lot 5. Brule River State Forest – Candlelight Ski and Snowshoe: Candles will light 5 kilometers of the After Hours Ski Trails including part of the snowshoe trail. Grills, picnic tables and a bonfire will be provided. Trail passes are not required for this event, which is sponsored by the Brule River State Forest with volunteer assistance from the Brule Valley Ski Club [exit DNR]. Copper Falls State Park – Candlelight Ski/Snowshoe: Get outside this winter and enjoy lighted trails at beautiful Copper Falls State Park! A 2.5-mile/1.6-km section of the ski trails, and a 1-mile snowshoe trail will be lit with hundreds of glowing luminaries. Afterwards warm up by the fire and enjoy refreshments provided by the Friends of Copper Falls State Park. Devil’s Lake State Park – Candlelight Snowshoe: It’s winter, but that doesn’t mean you have to stay inside! Cure your winter cabin fever and join us for this winter adventure! Go on a self-guided snowshoe (depending on snow) or hike through the park. Warm up by the campfire and make a s’more. Bring your snowshoes or borrow a pair of ours – we have lots of sizes to fit everyone in your family. Make sure you dress appropriately. Meet outside the Rock Elm shelter on the park’s north shore. Sponsored by the Friends of Devil’s Lake State Park. 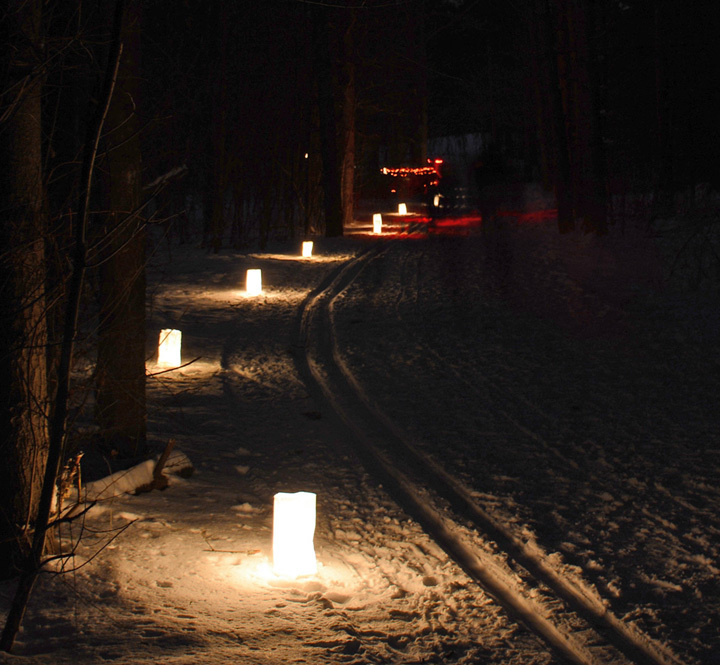 Kettle Moraine State Forest – Pike Lake Unit – 29th Annual Pike Lake Candlelight Ski and Hike: Hike, snowshoe or cross-country ski two 1-mile loops lit by more than 350 luminaries. Warm up at the North Shelter and enjoy a cup of hot chocolate and snacks at the bonfire outside. Northern Cross Astronomy will have their telescopes out to view the crystal clear winter sky. Dogs on a leash are welcome. A vehicle admission sticker is required. Interstate State Park – Candlelight Night in the Park: Experience a winter evening by candlelight as hundreds of candles are lit to guide skiers, snowshoers and hikers on separate trails. Both the ski and snowshoe trails begin at the Ice Age Center. There will be hiking opportunities no matter the snow conditions. Beginning at the Camp Interstate Shelter, hikers can enjoy a candlelit walk beside the St. Croix River. There will be warming fires at the trailheads. At the Ice Age Center enjoy food and refreshments served by the Friends of Interstate Park. Newport State Park – Candlelight Ski, Hike and Snowshoe: Experience winter beauty at Newport State Park! Ski, hike or snowshoe a 1.2-mile easy trail. The trail starts at the Picnic Area parking lot (Lot #3). There will be a shelter with refreshments and cookies, a lit fireplace and grill, and a bonfire to greet participants at the end of the trail. This event will be held with or without adequate snow for skiing. Richard Bong State Recreation Area – Return to Romance: Warm someone’s heart this Valentine’s Day with a visit to the park. Enjoy a candlelit walk, fine homemade desserts, warm drinks, a fire and live music from Wilde Thyme. Please call to pre-register 262-878-5601. This program is for adults only and cost is $6/person. You will also need a state park admission sticker on your vehicle. Meet at the Visitor Center. Don’t wait, this program fills quickly. Governor Thompson State – Candlelight Ski and Hike: Join us at Gov. Thompson State Park for a fun-filled evening of candlelit skiing and hiking. Warming fires and hot chocolate provided! Meet at the Woods Lake Picnic Area. The park and trails will be lit by candle luminaries and accented with ice sculptures. Skiers can take an easy 1-mile loop candlelit trail groomed for both classic (diagonal striding) and skate skiing as it weaves through the woods. Hikers are welcome to hike another 1-mile candlelit trail with scenic views over Woods Lake. Hikers, snowshoers and pets are not allowed on the ski trail, but are welcome on the hiking trail. Vehicle admission (park sticker) is required and can be purchased at the park office. Trails start at the Woods Lake Picnic Area off of Paust Lane, 1.5 miles west of Parkway Road off Ranch Road. Willow River State Park – Candlelight Ski, Hike and Snowshoe: Join the fun at Willow River’s Nature Center for our annual candlelight event. Enjoy 2-3 miles of candlelit trails for skiing, hiking and snowshoeing. There will be two bonfires and refreshments will be available. No pets allowed. This event is sponsored by The Friends of Willow River and Kinnickinnic State Parks. Visit the Friend’s website [exit DNR] for more information. MADISON – Preliminary registration numbers show hunters harvested 4,157 bears during the 2017 Wisconsin bear hunting seasons. MADISON – Wild turkey and black bear hunters are reminded to submit their applications before midnight on Dec. 10. Applications for permit drawings can be purchased through Go Wild or at authorized license agents. 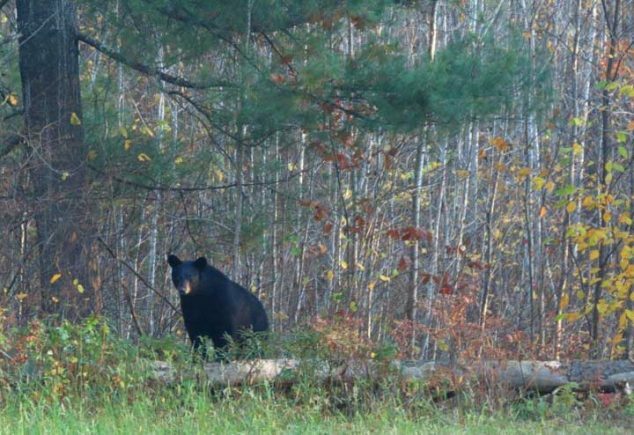 Harvest numbers from the 2017 black bear season are not yet finalized, but preliminary estimates show that hunters harvested more than 4,150 bears. Wisconsin Department of Natural Resources staff and the Bear Advisory Committee are currently in the process of determining 2018 harvest quotas. The deadline to apply for 2018 black bear and spring turkey permits is Dec. 10. Bear hunters are reminded that due to the high interest in this hunt, hunters must apply for several years before receiving a permit through the drawing process for most bear management zones. In order for bear permit applicants to retain their accumulated preference points, they must apply at least once during any period of three consecutive years or all previously accumulated preference points will be lost. If a bear management zone is selected at the time of purchase and the hunter is selected in the February drawing, their preference points will be reset to zero, even if they do not purchase the harvest permit. It is the applicant’s responsibility to be aware of drawing status – applicants selected in the drawing will be notified by mail shortly after the drawing, and may purchase their 2018 Class A bear license beginning in March 2018. Applicants may also check their status online through their Go Wild customer account. The season structure for the 2018 bear hunt is as follows. Sept. 5 to Oct. 9 – with aid of bait and all other legal methods not using dogs. Oct. 3-9 – aid of dogs only (Bait may be used to locate bear to hunt with the aid of dogs). Dec.10 is also the deadline to apply for a spring turkey harvest authorization (previously referred to as a tag or permit). These are issued through a preference-based drawing system where Wisconsin residents have preference over non-residents and landowners have preference over non-landowners. For more information on the turkey preference drawing, see the Turkey Frequently Asked Questions. Applicants may choose up to two time period and zone combinations that they would like to hunt. As a third choice, applicants may also choose one zone in which they will accept a harvest authorization for any time period. This third choice can be the same zone as the first and/or second choice. The second and third choices are optional, but applicants are encouraged to provide second and third choices to maximize their likelihood of success in the drawing. The harvest authorization drawing will take place in late December. Successful applicants will receive a post card by late January. Applicants can also check their status online through Go Wild. Successful applicants may purchase their required 2018 Spring Turkey License ($15 for Wisconsin residents and $60 for non-residents) and 2018 Wild Turkey Stamp ($5.25) in early March. Each harvest authorization will be printed at the time of purchase. All hunters are required to possess a valid spring turkey license and wild turkey stamp when they acquire their spring turkey harvest authorization. Unsuccessful applicants will receive a preference point that will increase their chances of drawing a harvest authorization the following spring season. All leftover harvest authorizations for 2018 spring turkey season will be available for purchase in late March ($10 for residents, $15 for non-residents), plus the cost of the Spring Turkey License and Wild Turkey Stamp. The 2018 spring turkey season will begin April 14 with the annual Spring Youth Turkey Hunt. The regular turkey season will begin the following Wednesday, April 18, and will consist of six separate seven-day time periods, with the final period closing May 29. The annual Spring Turkey Youth Hunt will be held on April 14-15 for hunters ages 15 and younger. Youth hunters 12-15 years must have a Hunter Education Certificate of Accomplishment, unless hunting under the Mentored Hunting Program. Youth under 12 years of age must participate in the Mentored Hunting Program during the two-day youth hunt, even if they have successfully completed a hunter safety education course. A spring turkey license, stamp, and valid harvest authorization are required to participate in the youth hunt. All other existing turkey hunting rules and regulations apply. Interested youth hunt participants should apply for a spring turkey harvest authorization before the Dec. 10 deadline. A permit for any time period can be used during the two-day youth hunt, but hunters are limited to the zone listed on their hunting authorization. Hunters with disabilities who wish to turkey hunt next spring on private land are reminded of an additional opportunity to hunt using a separate application and authorization form. Applications to conduct a Spring Wild Turkey Hunt for People with Disabilities on private land must be submitted using DNR Forms 2300-271 and 2300-271A. Forms must be submitted before Dec. 10 to a local DNR wildlife biologist or department office for the county where the hunt will take place. Please note that any applicant who applies for a disabled turkey hunt on private lands using the above forms may not apply for a permit through the regular spring turkey drawing. 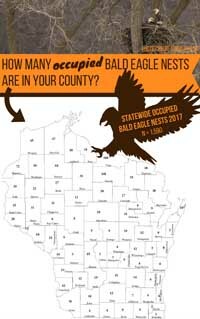 RHINELANDER – The Wisconsin bald eagle population is growing and thriving according to the 2017 bald eagle nest survey results. The comeback of the national symbol in Wisconsin continues 45 years after work to help restore eagle populations began. No growth in nests in habitat-rich Oneida County may signal that suitable nesting habitat in some northern Wisconsin counties is now all taken. Eagles are being seen in more parts of Wisconsin as they continue to expand their nesting range. “The Kenosha County nest was probably the biggest news this year because it is the first documented nest in the county since the survey began,” says Laura Jaskiewicz, the Department of Natural Resources conservation biologist who coordinates the aerial survey. “That was very exciting. Jaskiewicz said the 5.7 percent nest increase in 2017, from 1,504 to 1,590 reflected at least in part more extensive efforts to look for eagle nests along the Mississippi River Valley, where it’s typically more difficult to document them. The number of new nests in that part of the state contributed 30 percent of the total increase in nests over 2016. “We also had some interesting findings that suggest the eagle population in the northern part of the state is getting close to its carrying capacity,” Jaskiewicz. 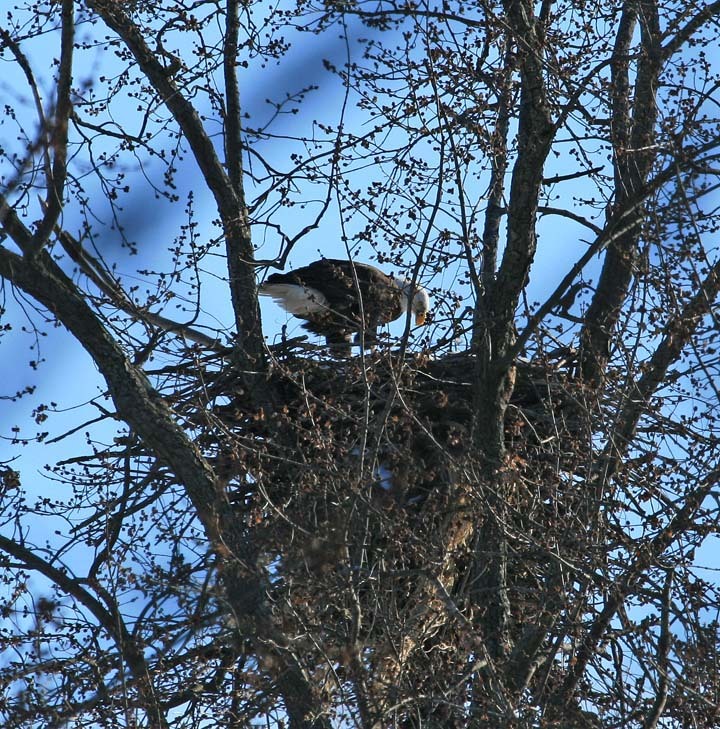 Longtime bald eagle surveyor Ron Eckstein, a retired DNR wildlife biologist, noted that for the very first time since detailed aerial surveys began in 1974, no new eagle territories were found in Oneida County. “This is a milestone because it reinforces the idea that in Oneida County we are near the biological carrying capacity for eagles,” Eckstein says. The 2017 survey, conducted by DNR staff from the Natural Heritage Conservation and Wildlife Management bureaus and DNR pilots, marked the 45th consecutive year that the bald eagle occupancy survey has been completed in Wisconsin, which makes it one of the longest running surveys of its kind in North America. “Bald eagle nests numbered 108 statewide when the surveys started in the early 1970s, when bald eagles were listed as state and federally endangered species. The record number of nests results from protections under the state and federal endangered species laws, declining levels of DDT in the environment, and DNR and partner efforts to help monitor and aid recovery. Bald eagles were removed from the state endangered species list in 1997 and the federal list in 2007. Eagle nests are federally protected by the U.S. Fish and Wildlife Service’s Bald and Golden Eagle Protection Act and the Migratory Bird Treaty Act, which celebrated its centennial in 2016. In addition, purchasing a DNR bald eagle specialty license plateoffers eagle enthusiasts a way to show their love for this majestic bird and to help fund the next conservation success. Search the DNR website for “eagle plate” for more information.